Vega is the lightweight workhorse of Arianespace and the European Space Agency that made its maiden voyage in 2012 after 13 years of development and testing. The Vehicle was built to haul small payloads into a variety of orbits including Low Earth, Sun Synchronous and Polar Orbits. 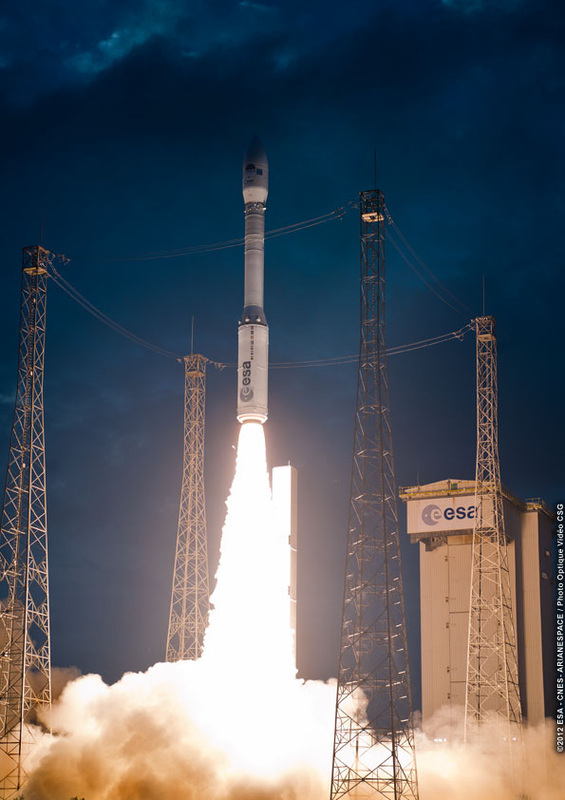 Vega is launched from Kourou, French Guiana being operated by Arianespace. 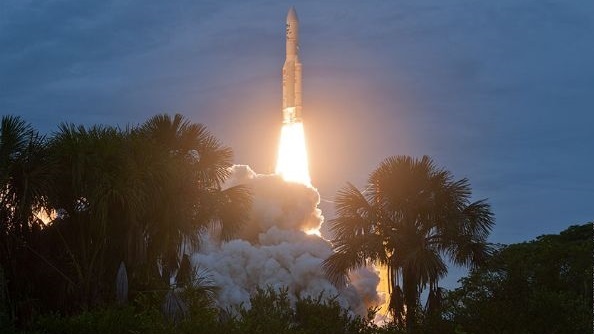 Along with the heavy-lift Ariane 5 and the medium-lift Soyuz 2-1, Vega completes Arianespace’s broad range of Launch Vehicles operating from French Guiana. 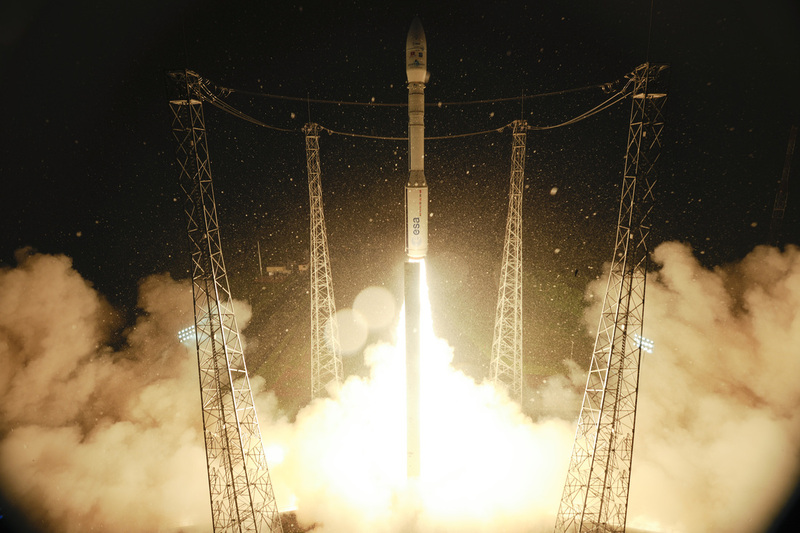 Vega offers customers a cost-effiicient opportunity to orbit smaller payloads. Vega is a three-stage all-solid launch vehicle with an optional liquid fueled upper stage for re-start and precise injection capability. The launch vehicle stands 29.9 meters tall, has a main diameter of 3.03 meters and a liftoff mass of 137,000 Kilograms. 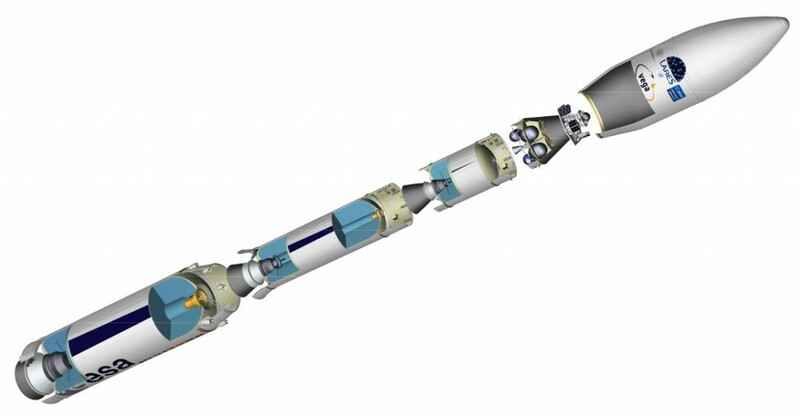 The Rocket can lift up to 2,500 Kilograms of Payloads – depending on the target orbit. The Core first Stage of the Vega Vehicle has on overall length of 11.2 meters without nozzle. It is 3 meters in diameter. The Motor is based on a high-performance European Solid Rocket Motor. P80 FW SRM has a carbon-epoxy filament wound monolithic motor case that is protected by a low density thermal insulation. The stage uses HTPB 1912 Solid Propellant. 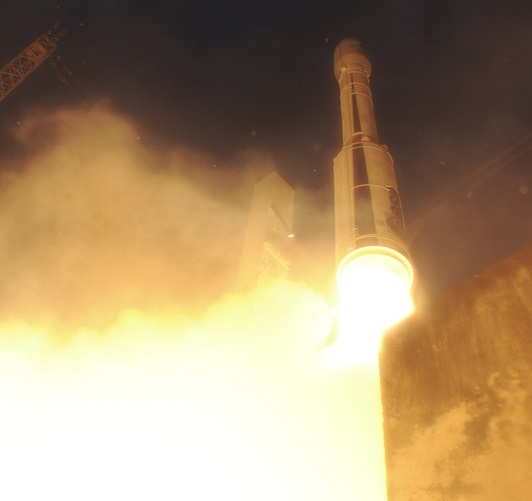 This type of propellant has a finocyl type grain shape and is based on flight-proven propellants that have been modified. The nozzle contains a 3-D Carbon-Carbon Throat and a protected flexible joint allowing the nozzle to be moved for vehicle control. The carbon-phenolic exit cone has an actuator attachment ring which is joined to the exit cone by overlapped structures. First Stage Thrust Vector Control is accomplished by two electro actuators moving the nozzle. Vega’s Electro-actuators Piloting Equipment (EPEV) controls pitch and yaw during first stage ascent. Inside the rear bay are Launch Pad interfaces used to hold the vehicle in place. Also inside the rear bay are the first stage Thrust Vector Control actuators and batteries. Engine Ignition is accomplished with a ignition pyro circuit. The 1T2 inter-stage provides the structural connection of the two stages. Inside the adapter are Range Safety Systems with batteries and a remote unit with destructive pyrotechnics. Stage Separation is accomplished with linear cutting charges and 6 retro rockets with ignition circuits to separate the two stages. 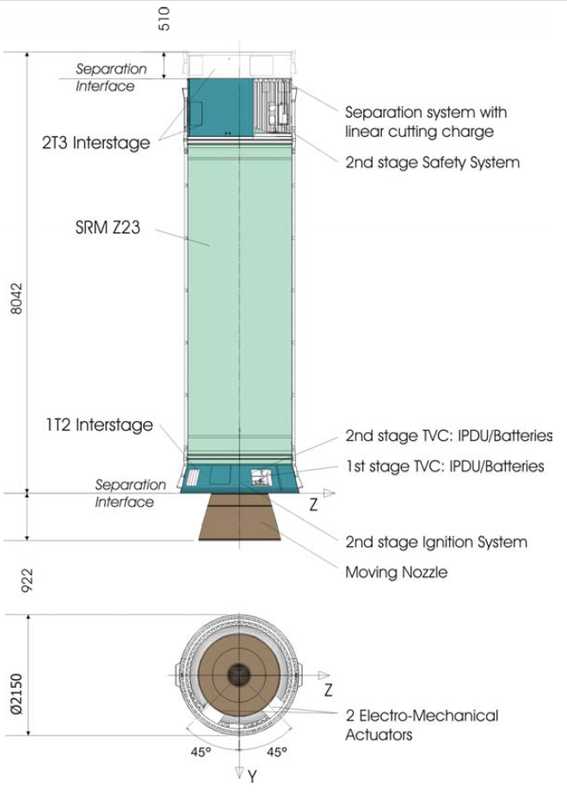 The second stage is also a solid-fueled rocket stage using a ZEFIRO 23 Solid Rocket Motor. The stage is 8.4 meters long and 1.9 meters in diameter and also uses HTPB Propellant. Stage and Nozzle design are similar to the P80 FW. Nozzle deflection is 7 degrees into every direction however. On the second stage side of the 1T2 interface is the 2nd stage Thrust Vector Control Equipment (two electro actuators mated to the nozzle and Li-Ion batteries). 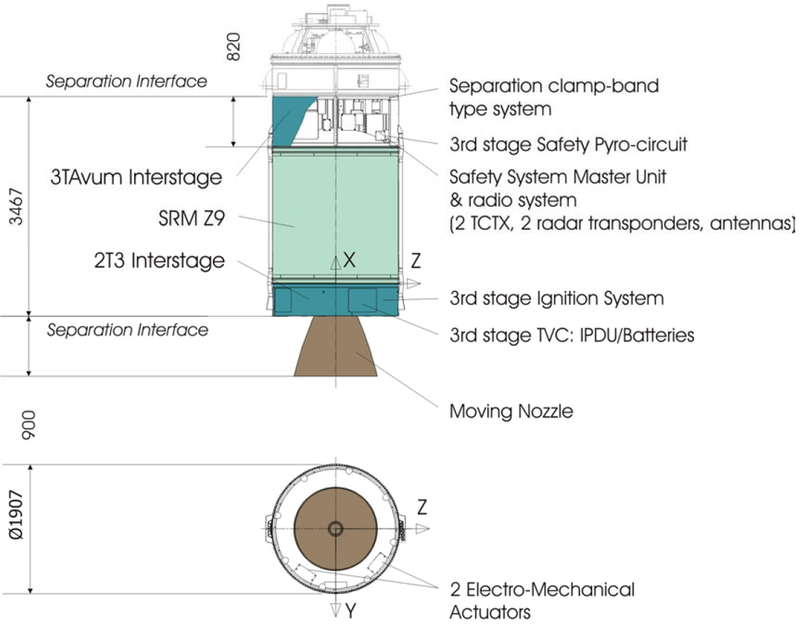 Second stage ignition is achieved by a pyro-circuit that is also part of 1T2. 2T3 forms the link between second and third stage and has a aluminum shell with stiffeners on the inner side. 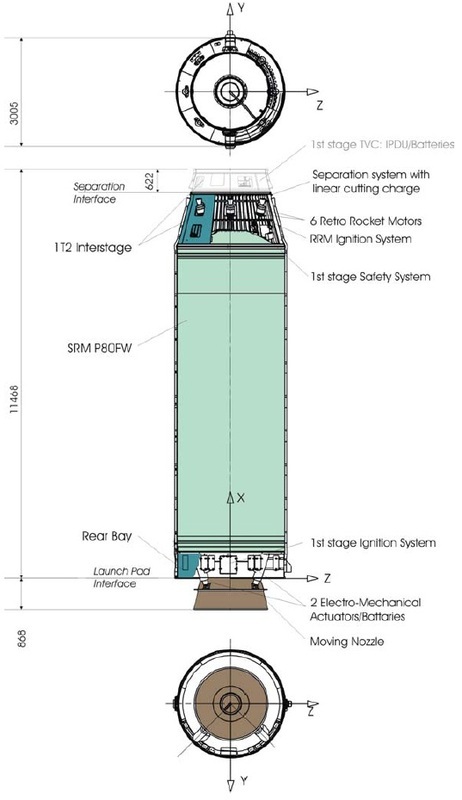 Of importance for the second stage, 2T3 contains a stage Safety system and associated subsystems. Z9 is the third stage of the vehicle. It is 4.12 meters in length and 1.9 meters in diameter and is based on the second and first stage design. The nozzle of the ZEFIRO 9 can be moved 6 degrees in every direction. The 2T3 interface contains TVC components, ignition pyros and the third stage Thrust Vector Control Box including a Digital Control Module and Power Drive Unit. Inside the 3TAVUM interstage section, most of the vehicle’s avionics are located that provide vehicle guidance for the first three stages of Vega. 3TA is 0.82m in length and is made of a a cylindrical aluminum shell structure. Stage Separation is accomplished by a clamp-band and springs pushing the stages apart. The Attitude and Vernier Upper Module (AVUM) is the 4th multifunctional stage of the Vega Launch Vehicle. It controls the first three stages via its avionics units and onboard computers and it makes the final engine burns finalizing the vehicle’s trajectory. AVUM is comprised of two parts. The APM – AVUM Propulsion Module – houses the 4th stage propulsion system and the attitude control system. The main engine and four spherical fuel tanks are mounted on a horizontal platform along with a external cylindrical skirt and Attitude Control System Engines. An RD-869-derived single chamber engine provides a multiple restart capability. It is certified to re-ignite up to five times. It burns liquid propellants (Nitrogen Tetroxide and Hydrazine) supplied by a regulated pressure system. The propellants are stored in four titanium tanks each holding up to 142 liters. Tank pressurization is maintained by gaseous Helium which is stored in a single vessel. Operational tank pressure is 35.6 bars. Attitude Control is provided by moving the main engine or by using the attitude control system while the vehicle is coasting. 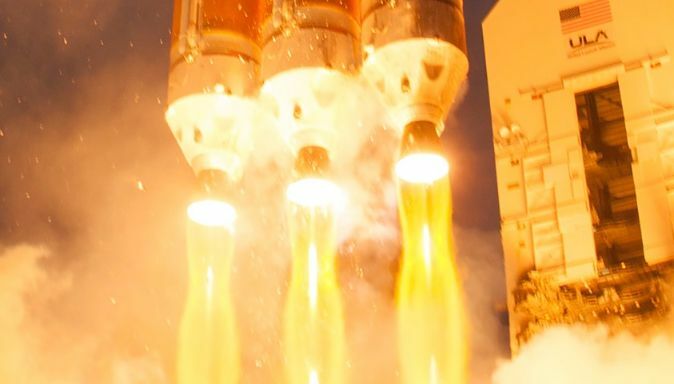 The ACS uses two clusters of monopropellant thrusters providing 240 Newtons of thrust each and being fed with Hydrazine from one central tank. During powered flight of Z9 and AVUM, the system is used for roll-control and spin-up only. 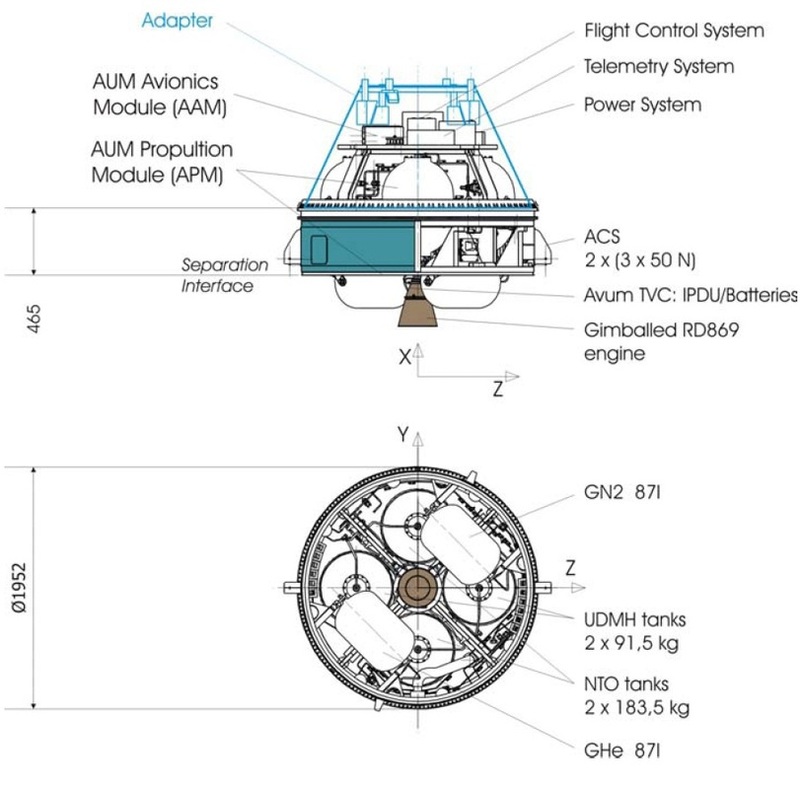 The AVUM Avionics Module (AAM) houses almost all of the avionics installed on the Vega Launcher. Inside AAM are the flight control systems, telemetry units, the power supply, thermal control systems and the safety system. These avionics enable Vega to conduct its mission autonomously and execute all mission operations except range safety which has to be manually activated. The AVUM Control System provides attitude control and stabilization, navigation and guidance as well as vehicle management and commanding during the entire flight of the vehicle. Navigation and Attitude data is provided by an Inertial Measurement Unit. The Onboard Computer executes all guidance related tasks and forms the core of Vega’s brain. The Payload Fairing is positioned on top of the stacked vehicle and its integrated payloads. It protects satellites or other spacecraft against aerodynamic, thermal and acoustic environments that the vehicle experiences during atmospheric flight. When the launcher has left the atmosphere, the fairing is jettisoned by pyrotechnically initiated systems. One system splits the fairing vertically, the other frees the to halves. The fairing then falls back to Earth and burns up in the atmosphere. Separating the fairing as early as possible increases ascent performance. Vega’s fairing is cylindrical in shape, and has an inner diameter of 2.6m. Payload Adapters interface with the vehicle and the payload and are the only attachment point of the payload on the Launcher. They house equipment that is needed for Spacecraft Separation and ensure that the satellite or spacecraft is secured during powered flight. A variety of payload adapters will be available to satellite customers in order to fit a large number of spacecraft dimensions and interfaces, however, for Vega there is currently only one off-the-shelf device that would not require lengthy redesigns.